A correspondent on eHam recently asked about Calculating uH for baluns…, his interest being in selection of appropriate cores and formulas for calculating the necessary number of turns . The inductance of a winding on a high permeability toroidal core can be shown to be (µN2A)/(2πr) where N is the number of turns, A is the cross section area of the core, and r is the radius of the core. It is a simple rearrangement then to say that L=N2Al where Al=(µA)/(2πr) and Al can be specified for a core of particular dimensions and material, assuming that all those parameters remain constant… more on that later. An approach to the design of conventional untuned flux coupled transformers is to design the primary winding to have sufficient impedance that the primary current (due to hysteresis and eddy current losses) is sufficiently low. That implies choosing a core type, and sufficient turns that the flux level is below saturation. This method leads to choosing a number of turns to for a target flux level, it is effectively choosing the inductance of the primary winding. loss frequently prevents operation anywhere near saturation flux density. To deal with the loss, permeability can be treated as a complex quantity where µr=µ’-jµ” where the µ” provides for a loss term in the inductor impedance equation. loss is relatively low below 1MHz, inductor Q for a lossless winding (µ’/µ”) is greater than 10, but by about 15MHz, Q is just 1. Simple designs based on an assumption that µr is constant (eg independent of frequency) and that the core is lossless are inadequate for some materials at some frequencies. Designs using Al (explained earlier) often fail for this reason, for example a value of Al specified for a particular core of #43 material is quite worthless for calculation above 1MHz . Nevertheless, calculators that hide this fact abound. Stray capacitance becomes quite relevant in RF applications, modifying the inductor impedance, possibly resulting in self resonance within the intended operating frequency range. Self resonance is not necessarily a problem, it may be quite acceptable with lossier cores, but can be a problem with low loss cores. Whilst it is tempting to design such an inductor or transformer to operate at a flux level close the the specified saturation flux density, for many core materials, the loss prevents continuous operation at anywhere near saturation flux level. Designs need to consider the average power dissipation and temperature rise of the device. Some cores can be very slow in reaching operating temperature, a time constant (time to reach 63% of final temperature) of more than 2000s for a naked core is not uncommon and needs to be considered when observing temperature rise in a test scenario. 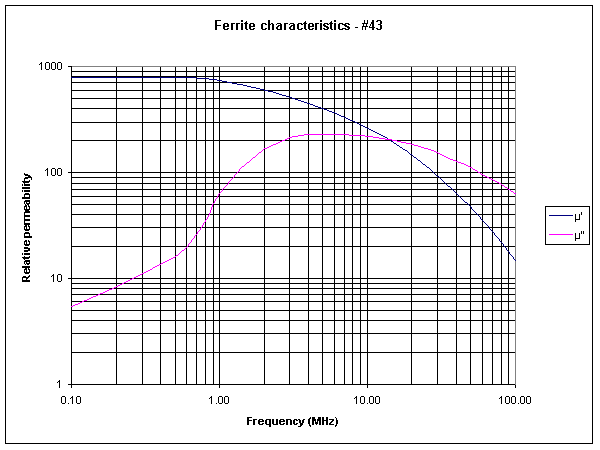 Many of the techniques used for inductor and transformer design by 50Hz engineers are not appropriate to RF design.